Whittle down my TBR--an ongoing goal that will probably never be finished due to the number of books I continue to add to my TBR on a constant basis. Read more of the books I already own--this goal is being challenged via the Mt. TBR Challenge that I've been participating in since two years prior. Finish reading series I've already started--this goal is overwhelmingly immense and I'm forever looking for reading series challenges that would help me complete this goal. In light of the fact that I'm actually trying to be more laid back about my bookish challenges this year, I didn't want to officially participate in anything that required a lot of linking up or making updates. So, taking a page from a series challenge I attempted a little over two years ago, as well as my Reading Goals from 2016's Bookish Resolution chaos, I've decided to create some tentative personal goals for myself, and try to see them through for the rest of 2017. If this personal challenge works out, I may continue to use it as a format for future series challenges, just to get those series I've already started reading completed and knocked off of my list. I recently went through my Series spreadsheet (yes, I have one of those), and cleaned out series that I have a pretty good certainty I will not be finishing, for various reasons. Meanwhile, I also tried my best to update my list to reflect my current state of 'Series Being Read' to see what my status was. Between all the series I'm currently reading, all the series I haven't gotten around to finishing, and some series that I haven't quite decided whether I'm giving up on or not... I still number a little under 100 series that need to be... dealt with. I suppose this is better than where I was last year--last year, I believe I expressed that I had a little over 100 series to complete. Anyway... enough talk. Basically, I need to get disciplined. So the following tentative listing will reflect what I am trying to accomplish in 2017, series-wise... And yes, this list not only includes series I need to finish, but also series that I will start new and hopefully read all available books out in 2017. Because I know I'm going to start new series anyway, so may as well include them in the challenge, no? I'm going to list a few tentative series for each goal, but for organization's sake, I'm going to be keeping track of this particular goal at a main page that I will link to in the near future when I get around to creating it. This is just a tentative list, but for sure, I will be reading and finishing the first three series listed, as they are also part of my 2017 Reading Assignment Challenge. The Others will be completed in March of this year, and I'm hoping to finish the series at least by mid-year. Lucky Harbor is the only series I'm not certain I will be able to finish, but it is really one of my main goals this year. Some other series I wish to finish, either this year or next, are For Me by Cynthia Eden, Steele Street by Tara Janzen, Aftershock by Jill Sorenson, and The Malediction trilogy by Danielle L. Jensen. Apparently I'm a sucker for ongoing series, especially the Romantic Suspense or Contemporary Romance, or now even the Historical Romance persuasion. Thus, I have plenty of books in this category to finish... but it's more a matter of if I can keep up with this goal, because I really bombed it in 2016. Again, this is a tentative list and may end up with some changes as the year progresses, but as of now, the two series I definitely want to catch up with are Harmony and Arcane Society. Tracers might be a bit of a cheat series since I devour each book as it is published anyway, and so it's possible I'll swap it out for a different series just to be fair (in my own twisted, mad mindset). Three alternate series I can use for this goal include: Moreno & Hart by Allison Brennan and Laura Griffin; SWAT by Paige Tyler; Nikki Heat by Richard Castle. As I'd already stated, I'm going to start new series no matter how hard I try to curb my temptations. So if that's the case, I might as well include them in this personal challenge. At the least, I can keep tabs on them and motivate myself to finish the completed ones or catch up with the ongoing ones so I'm a little more on track to continue this challenge in 2018. Actually, this goal started off as two different goals (one for completed series, one for ongoing series), but I decided to combine them as it is hard for me to determine whether certain series are completed or not. Then I had a higher number of series to finish as my goal, but decided to take it easy on myself and just enjoy having a >100% completion rate if I manage to read more than 10 series. I'm trying to be more laid back this year, after all. As of the publishing of this post, I have already read 1 book in the Spindle Cove series. Some of my alternate choices include: ICE: Black Ops Defenders by Melissa Cutler; Tremaine Traditions by Kylie Brant; Sevenwaters by Juliet Marillier; Predator trilogy by Allison Brennan; Blackthorn & Grim by Juliet Marillier; River Pack Wolves by Alisa Woods; Stop the Wedding by Lori Wilde... and many, many, many more. I am currently listening to the audio book of Forgotten Sins by Rebecca Zanetti, the first book of the Sin Brothers series, wherein there are only four books, and I'm quite certain the series is completed. This series may or may not end up filed into this goal. The above listed books will be read this year because they are on my Reading Assignment Challenge list. Overruled, as of the posting of this piece, has already been read--since I don't know if I'm going to continue the series, the book goes here in this category. Other '1sts' I'd like to read include: Maiden Lane #1: Wicked Intentions by Elizabeth Hoyt; Lady Darby #1: The Anatomist's Wife by Anna Huber; Waverly Place #1: Garden Spells by Sarah Addison Allen; Hudson Valley #1: Nuts by Alice Clayton; K-9 Rescue #1: Irresistible Force by D.D. Ayres; LOST #1: Broken by Cynthia Eden; Shadow Agents #1: Alpha One by Cynthia Eden... and then some. Yeah, this is going to be a pretty hefty challenge. 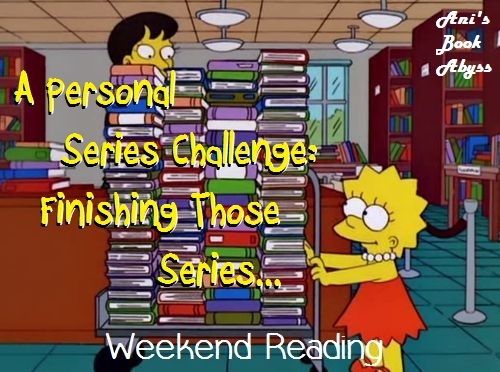 But it's a personal challenge, and while I'm keeping myself accountable for most of these series, to be honest, I'm not really going to push myself. I'm thinking about this as a guideline, and what I don't manage to finish this year, I will just roll over into the next year. Right? I am all about your first three goals too. I so need to get myTR down and read more books I own. You have some goals with the series!! I loved that Emma Chase series so hope you do to. Good luck!